Tlert: A New Texting Experience For Your iPhone! Most people never get a chance to have a whole new texting experience! With Tlert, however, you will be able to text on your iPhone in a way you have never experienced before. Have you ever been annoyed that the only way to answer a text message on a stock iPhone is to completely close the current application you were in? Obviously Apple doesn’t understand that people would enjoy the ability to answer text messages within applications this is why it was left to the jailbreaking community to develop an alternative. Intelliborn has created a very powerful tweak called Tlert that has been around for awhile now, but still is not widely known to all. 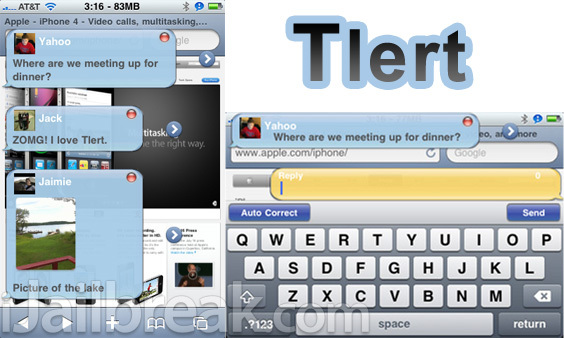 Inteliborn’s tweak Tlert allows you to text message that way Apple should have designed the texting process. With less interference on your screen, a more pleasing UI (user interface), and landscape replies from any application, including the Lock Screen! Tlert is a tweak that you need to experience to truly understand its capabilities. Tlert uses ViewThrough Patent Pending Technology for alerting users of new events and information. Compose an SMS to anyone from any app! Reply to any message from any app! More pleasing UI – with colors you can choose from! Message will show if not in current conversation. If you are interested in Tlert you can download a free trail from Cydia. If you are interested in purchasing the full version of Tlert you can do so through the Cydia store for a price of $6.99! Let us know if you think this tweak has created a new and enjoyable texting experience for your iPhone in the comments section below. Update #1: Tlert has been updated and is now know as Messages+. biteSMS allows much more advanced features and ad supported version is free. Why to pay for this…?? I have been using this tweak for a while. DO NOT BUY! extremely unstable. will crash constantly and drive you insane. not worth the money at all.